This time last week, I was in Poland visiting the infamous Auschwitz-Birkenau concentration camp. It was of course, the scene of some of the worst atrocities of the 20th Century. 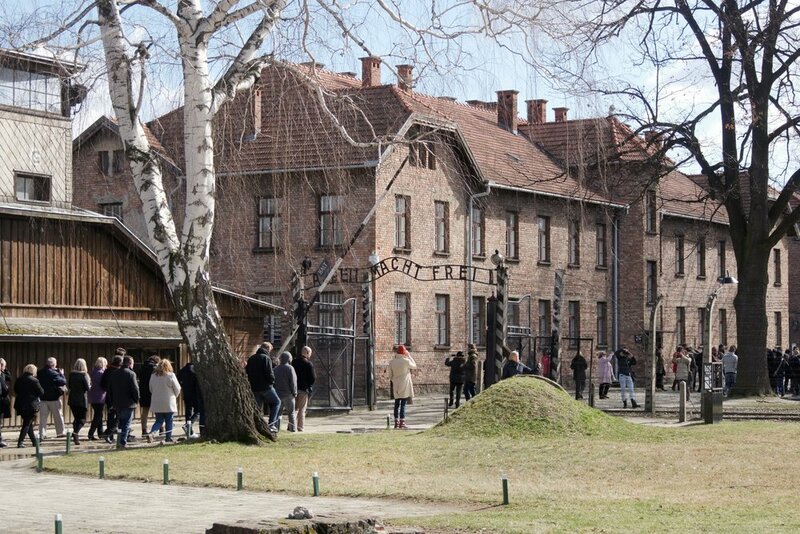 In this one complex alone, 1.5 million innocent people - mainly European Jews - were tortured and killed by the Nazis. It was a surreal experience and very difficult to describe. I think because I'd only seen Nazism in black and white documentaries, or in movies, the whole thing had started to occupy a semi-unreal part of my brain...but in a way that I hadn't realised until I arrived there. It's only when I stood before these very commonplace buildings, under the same familiar sun that lights everyday life, while breathing the same unremarkable air as always, that it all became very stark. This actually happened. The shooting wall. To the left, the poles for hanging people by the wrists. The darkest part of the complex was Block 10. Outside was a shooting wall, where people were lined up and killed by the bullet. Beside that were wooden poles with hooks, by which people would be hung by the wrists with their arms behind their backs until their arms broke. Within Block 10 itself, there were dungeons with suffocation cells, starvation cells and confinement cells. (In these horrific places, 4 people would be crammed into a tiny claustrophobic space that gave them no room to move, let alone sit down or sleep.) There were also rooms for Dr. Josef Mengele's gruesome science experiments here - many people died just from the sheer pain of them. Down the street, there were gallows for hangings. And near the the perimeters, there were, of course, the infamous gas chambers and ovens. Most people would simply be worked to death on a mere 700 calories a day, meaning almost no-one survived beyond 3 months. Even the fittest. Women's death block where the weak would be left to die without food or heat. What struck me most about all this was how dementedly inventive the Nazis became in the art of torture and killing. It's almost like they got bored with exterminating lives in straightforward ways, and made a twisted game of concocting elaborate methods of cruel and unusual punishment, just for their own entertainment. I couldn't understand how any single person could be in a frame of mind to do these things to other human-beings. But what made it even more astonishing, was that this wasn't just a single person at all. Literally thousands of soldiers were so brainwashed by the Nazi ideology that they engaged in these activities all across Europe, with their consciences seemingly untroubled. It's simply incomprehensible. And yet, not a totally foreign concept. As I heard the stories of suffering in Auschwitz, I couldn't help but draw parallels with Islamic State (ISIS) today. They're the same as the Nazis in so many ways. Basic killing doesn't seem to satisfy them either; they're keen to make a sport out of it. They throw people off high buildings, set others on fire, put some in cages to drown them in water, crucify, shoot, stone, behead...the list goes on. Just like Nazis, they too are driven by an evil ideology that has overtaken the minds of multitudes - an ideology that thinks murder of innocents is justified to fulfil its aims. Just like Nazis, they have designs to impose their ideology upon the whole world through violence. Just like the Nazis, they want to establish an empire to do so. And just like Nazis, they have a particular disdain for the Jews. The connection was solidified when I coincidentally arrived back in the UK just as the Westminster Terror Attack was breaking in the news. By the time I got home and reached a television screen, the all-too-familiar routine was being played out in the media. We all know how it goes by now. Key political figures trotting out the usual platitudes:"Islam is a religion of peace." "These attacks have nothing to do with Islam." Liberals showing more concern for what this might mean for Muslims, than for the victims of the atrocity themselves. Those same Liberals dismissing as 'Islamophobic' bigots, British citizens who were trying to suggest it's time we considered that Islam may have an inherent violence problem - especially when so many do their killing to the refrain of 'Allahu Akbar'. The historically inaccurate rhetoric being espoused that Muhammad would never condone such savagery himself. The usual mournful cartoons and hashtags popping up on social media. People standing behind reporters holding candles. Other nations lighting up their landmarks with the Union Jack to show solidarity. It all happened like it always does. The BBC's Andrew Neil meanwhile, was soon delivering his now customary monologue to ISIS - himself drawing a connecting line between what they were doing now and what the Nazis had done in the past. And he was busy proclaiming that Britain would win now, just as we did back then. But the question is, 'will we?' Imagine if the old generation had tried to tackle the Nazis in the same way we currently try to tackle Islamic terrorism today. The Liberal elite would have insisted we welcome Nazis into the country without proper background checks for a start. When those Nazis then routinely murdered British citizens on the street, committed similar crimes across Europe, and news filtered out that they were torturing and gassing millions of Jews in concentration camps, the key political figures would have taken to the radio to insist that 'Nazism is an ideology of peace' and that 'these attacks have nothing to do with true Nazism'. The same Liberals would have shown more concern for what the genocidal attacks might mean for the Nazis than for the victims of the atrocities themselves. If the likes of Winston Churchill had stood up in parliament and suggested Nazism might have an inherent violence problem, he'd have been dismissed as a 'Naziphobic' bigot. Even as the perpetrators carried out their murders to the refrain of 'Heil Hitler', the Left would have been insisting that Hitler had nothing to do with it, and that he is a man of peace who would never condone such savagery. Instead, people would have responded by drawing mournful posters and pasting them all over town, and then stood around holding candles.